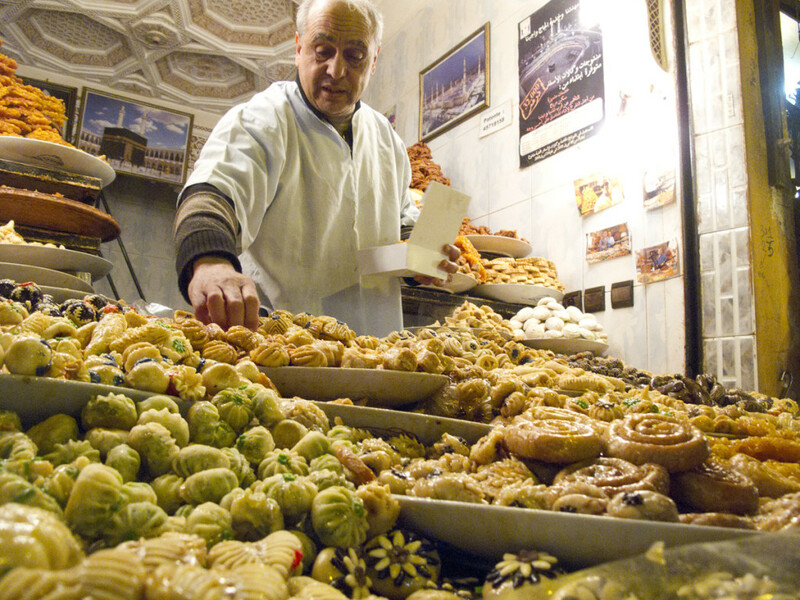 A vendor in the souks peddles homemade treats. Photo by Molly Hayden, USAG Bavaria Public Affairs. MARRAKESH, Morocco — Morocco is the heart of the Maghreb region in North Africa and Marrakesh is its dizzying pulse. And that chaotic beat starts in the Jemaa el-Fnaa. By day, the Jemaa el-Fnaa, or town square, allures travelers with snake charmers bewitching cobras with flute music, makeshift dentists willing to pull a tooth for a quick buck, henna artists and numerous vendors, all vying for attention of passersby. As the sun begins to set, the square gradually comes to life with a circus of storytellers, acrobats, fortune tellers, musicians and dancers. Pop-up restaurants move in for the dinner crowd, with fresh ingredients arriving daily. The entertainment in the square is a must-see and worth visiting a few times during the day to witness the fascinating gradual transition. But sights outside of the square hold a rich history, as well, and offer a more intimate glance into city life and Moroccan culture. Navigating the narrow, winding alleyways of the souks, pedestrians must contend with bicycles, motorbikes, scooters, push carts, pull carts and donkey-drawn carriages for coveted space. Vendors call out “Ali Baba!” to get the men’s attention and engage potential customers in just about every language to entice them to visit their shops. Once inside a shop, bargaining is the name of the game. Prices are never listed but in most cases you can generally shoot to pay half of what the starting price is for wares. Getting that fair price takes effort and patience, and the willingness to walk away if needed. From jewelry and clothing to spices, lamps, carpets and items used to create black magic, anything and everything is for sale in the souks. The area is confusing and it’s easy to get lost. Ask a shop owner to point you in the right direction if the need arises, as they are less likely to ask you for money in exchange for information. Likewise, hold your money tight; pickpockets are as plenty as they are skillful in the souks. A money belt, or equally secure location, is advised. For a little peace and quiet head to the Medersa Ben Youssef, just a few block off of the town square. The Islamic college of yesteryear is the only religious entity in Marrakesh that allows non-Muslims to enter. The school closed in 1960 and reopened to the public as an historical site in 1982. The building details the golden age of Moroccan architecture and design including the decorative zelilij (glazed tiles) and carved stucco lining much of the exterior. The site is open daily from 9 a.m. to 6 p.m. and costs around 50 dirham or 4.50 euro. Dating back from the time of the Sultan Ahmad al-Mansur, the Saadian Tombs are the final resting places of around 60 of the rulers and members of the Saadi Dynasty. The tombs were enclosed in an ancient walled garden that was hidden from public view until discovered in 1917. The complex is modest but beautifully decorated and consists of three ornate pavilions. The first contains the graves of 18th-century Alaouite princes, the second is noted for its portal in Andalucian style, and the third, the Hall of Twelve Columns, contains the tomb of the Sultan. Admission into the tombs is 10 dirham (less than 1 euro) and can be visited daily. Opening hours are 8 a.m. — noon and 2:30 — 6 p.m. The Majorelle Gardens offer a plush escape from the arid landscape of Marrakesh. It took French painter Jacques Majorelle forty years to create the 12-acre botanical sanctuary which houses a bamboo forest, masses of red and purple bougainvillea, banana trees and coconut palms. The raised pathways create a platform to view the bubbling streams and tranquil pools filled with water lilies and lotus flowers. Scattered around the grounds is a collection of carved and painted doors and ceiling dating back to the 17th century, as well as the impressive collection of basins and fountains, adding to the historical artistry of the gardens. The attached Islamic Army Museum is the painter’s former studio, which now houses a small collection of jewelry, embroidery and carved wooden items. The garden has been open to the public since 1947 until the painter’s death in 1962, when it fell into neglect for nearly two decades. Fashion designer Yves Saint Laurent and his partner Pierre Berge later restored it. A statue commemorating St. Laurent is a centerpiece of the garden and the final resting place for his ashes, scattered after his death in 2008. Entrance to the garden is 50 dirham, with an extra 25 to tour the museum. It is open every day of the year with varying hours. October 1 — April 30, 8 a.m. — 5:30 p.m., May 1 — Sept. 30, 8 a.m. — 5 p.m., and the month of Ramadan from 9 a.m. — 5 p.m. While many Moroccans wear Western clothing, it is still a conservative country. Headscarves are not required, but women should dress conservatively – no bare midriffs or shoulders. Neither men nor women should wear shorts, even in the hottest months. Photography is allowed almost everywhere, but be careful not to photograph religious services or government buildings. If you want to photograph people, ask permission first as the level of skepticism of photography varies. In exchange, the subjects may ask for compensation, especially in the Jemaa el-Fnaa. Walking is the best way to view the city, as it’s small and compact. For explorations outside of the Medina (the walled, older portion of the city containing nearly all of the sites) small cabs are available. Make sure to agree on a price before accepting a ride. Bargaining is expected, so the first price you hear will most likely be too high. For example, a trip from the Medina to the bus stop should cost around 30 dirham, and service to or from the airport is around 100. While the Moroccan people are more than friendly, be aware of ulterior motives. Locals in the city may offer to help, but it usually comes with a price. If they offer to take you somewhere, it’s generally their shop or restaurant. Be vigilant and firm but allow yourself to get lost in the experience. The city is aggressive, but amusing, and that’s all a part of the dizzying Marrakesh charm. And if you need a good fiction novel to go with your adventure, “The Storyteller of Marrakesh” by Joydeep Roy-Bhattacharya makes a fine travel companion.